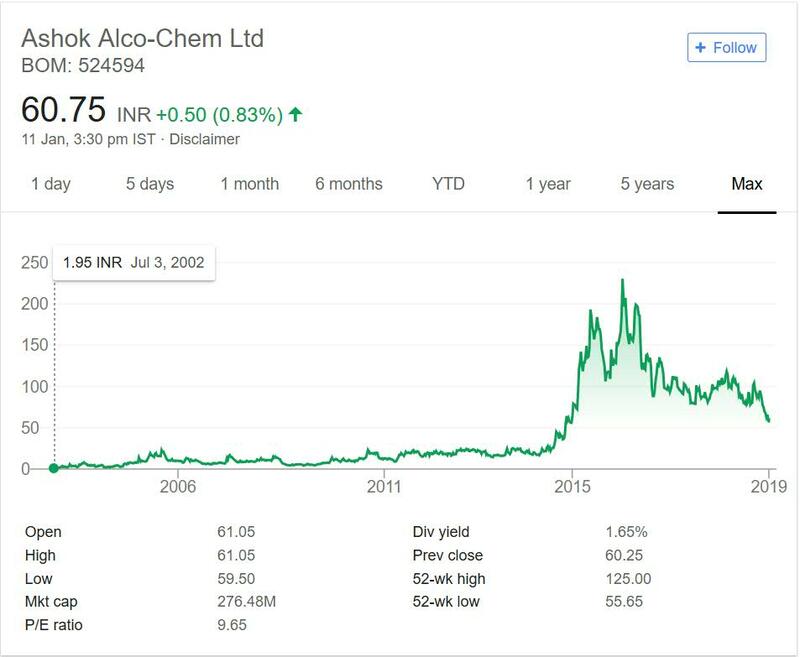 Ashok Alco-Chem Limited is in portfolio of Subramanian P. He is one of the top investors in India. The company was established in year 1992 in Maharastra. As per the Company website it is promoted by the Kadakia family for manufacturing and marketing of Industrial Alcohol, Acetic Acid and other downstream products like Ethyl Acetate for industrial use in pharma, ink, paint, adhesive, resin, flexi packaging, perfumery and many other industries. Major products of Chemical division are Ethyl Acetate , Glacial Acetic Acid , Acetaldehyde . Major products of Ceramic division are Ball Clay , Quartz , Feldspar. It also has global trading division which mainly trades in Minerals like Bauxite. Chemicals division is very vast and there are too many companies listed. The space is huge as there are many commercial compounds. Companies try hard to maintain their portfolio and grow it as well.As per Dow theory of technical analysis price performance over a period of time reflects Company state. The company was trading close to 2 in year 2002. If you see the graph you can easily spot the huge building created after year 2005. Before that Company was having slow flat movement upwards. If you take start and end point into account then Company has given more than 30 times return in last 15 years or so. This is good return by any standard. It also gives more than 1% dividend rate at current market price. Based on the price performance Company does look attractive. It is still a very small player and has potential to grow big. The company is not that popular and has made money for investor in past. Chemicals sector has been investor favorite in last few years. The sector has seen many multibagger in past. We have seen small companies grow big over the years and make huge amount of money in the process. The sector is still posed to grow as with time need for new chemicals and research is going on. This will drive the growth. Other industries are also potential customer of end product from Chemicals sector. The best way to evaluate a Chemical company is to learn the use of compound it creates. If the end product has good market then Company will see growth in future. Ceramics is yet other under penetrated sector. The demand of products from this sector is both in industrial segment and common people. This section should also be seen. The company has decent presence in both. It started as Chemical company and then entered other two segments as well. The trading segment is something I am not too convinced. This business is more of buying from local market and selling abroad. Company claims that it improves the top line and adds to revenue but I am not too confident on this mode. You can track the company by adding it to your stock watch list. It has performed well in past and has potential to do good in future. You need to track it closely and compare with other companies in sector before making a decision.